i just want to make sure i'm thinking about this correctly. true or false - a picnic table style (6" individual boards, spaced 1/8" or so apart - think deck boards) table will hold up better than a solid glue up. assuming average neglected finish (initial coat of epifanes applied by us) and we'll guess that it is partially exposed to direct sunlight. i was planning on using 1.5" thick white oak. I agree with Gary. Cupping can be excessive. Further, white oak is a high moving species group. You can expect as much as 8% size difference between wet and dry, or nearly 1/2". Your small 1/8" spacing seems a bit too small, assuming you will have fairly dry wood initially. Plus, consider how much the fasteners will be moving. For this reason, we put fasteners in slotted holes and do not tighten them too much...they need to slide as the wood swells and shrinks. Rather than put fasteners at the edges, put them closer to the center (mid width) of the piece. Finally, 1-1/2" thickness is possibly a bit thicker than needed. Many decks are made with 5/4. For a nice looking product, consider "5/4 radius edged treated syp decking" for the top. It is both a structural product and great appearance product. As most of the time, this product is soaking wet after treating, no spacing or 1/8" between pieces is needed. Again, cupping can be an issue, so many people like to put the "bark side" down. This means the cup is downward (the piece tends to crown). White oak yellows when exposed to UV. If you've never worked with antique yellow poplar, you would think I am crazy, as fresh cut poplar would quickly rot. 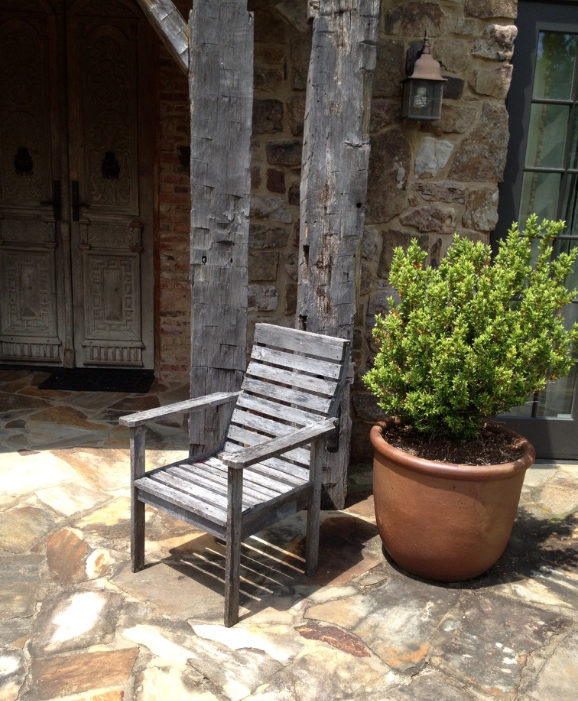 However, I have two armchairs made from antique poplar barn siding. They have been exposed to all outside elements for 7-8 years and no protective finish of any nature has been applied. The wood is light in weight and very easy to cut and shape.